The Order of Newfoundland and Labrador is the highest honour of the province. The object of the Order is to recognize individuals who have demonstrated excellence and achievement in any field of endeavour benefiting in an outstanding manner Newfoundland and Labrador and its residents. The first investiture took place in 2004. Any Canadian citizen who is a present or former long-term resident of Newfoundland and Labrador is eligible for nomination to the Order. The only exceptions are public officials, such as judges, members of the Senate, House of Commons, House of Assembly or legislative assembly of a province, members of municipal, town, regional councils or local service district committees who may not be nominated while they are in office. Posthumous nominations are not accepted. Organizations, groups, or couples may not be nominated; the Order is for individuals only. Additionally, an individual who is not a Canadian citizen or current or former long-term resident of the province, but who has demonstrated excellence in their field of endeavour, and who has benefited the province and its residents in an outstanding manner, may be nominated as an honourary member. If you know of someone who has made an outstanding contribution to Newfoundland and Labrador and its residents, you should consider nominating them for the Order of Newfoundland and Labrador. It is a special way to honour an individual you respect and admire. 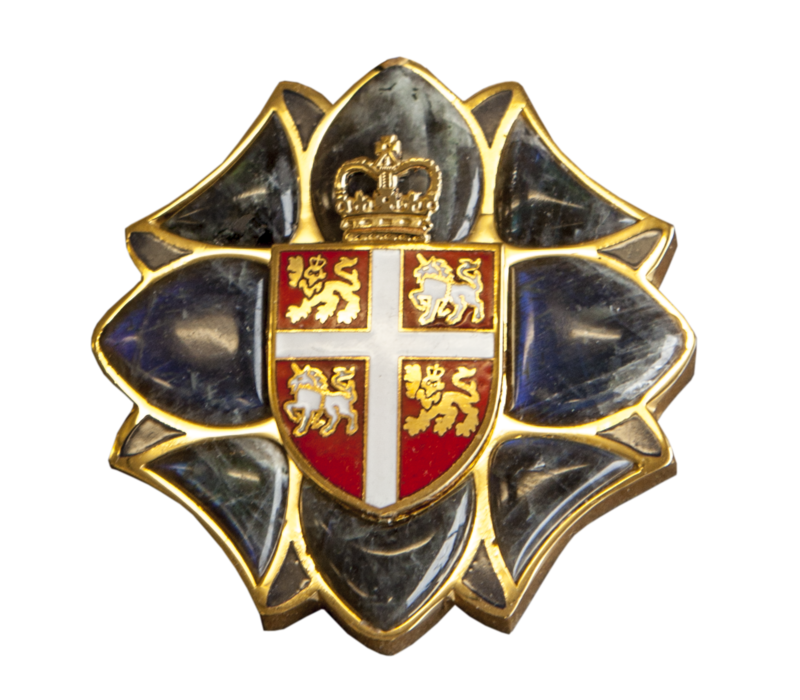 At a formal ceremony, the Lieutenant Governor of Newfoundland and Labrador, as Chancellor of the Order, will present each recipient with a medal bearing the shield of Newfoundland and Labrador surmounted by the Crown. A member will receive a certificate signed by the Chancellor and sealed with the seal of the Order, as well as a miniature medal and a lapel pin. The medal is worn with a blue, green, white and gold ribbon. Members of the Order are entitled to use the initials O.N.L. after their names. The Order of Newfoundland and Labrador Advisory Council selects members to be invested into the Order each year after considering all nominations received. For more information about the Order of Newfoundland and Labrador visit our FAQ section. The insignia of the Order is in the shape of a stylized pitcher plant (sarracenia purpurea Linnaeus), which was declared Newfoundland and Labrador’s floral emblem in 1954. The petals are crafted with the provincial mineral, Labradorite. The pitcher plant is found primarily in bogs and marshland throughout the province. It has a large wine-red fl ower with a red and gold centre, and hollow pitcher-shaped leaves are attached to the base of the stem. The insignia of the Order has at its centre the Arms of the Province, granted by King Charles I, in January 1638. The Arms incorporate some of the most ancient heraldic symbols, the unicorn representing Scotland and the lion representing England. The gold elements of the medal represent the excellence of achievement that the Order of Newfoundland and Labrador recognizes. The Crown is taken from the official standard of the Lieutenant Governor of Newfoundland and Labrador, the Chancellor of the Order of Newfoundland and Labrador. It symbolizes honour and merit, and recalls Newfoundland and Labrador’s place as a province of Canada, a constitutional monarchy, and as part of the Commonwealth.